I’ve met many women who assign a significant meaning to the size or number on their clothing labels. The bigger the number, the worse they feel. One woman I know refused to purchase a jacket she wanted and would wear because the only size that fit her had “16” in the label. No matter that the entire range seemed to be suffering from some kind of currency upheaval, where something that was previously a 12 is now an 8. No. It didn’t matter what other factors may have been at play, including the jacket was incorrectly sized. She was not purchasing ANYTHING (emphasis hers) that was a size 16. Even if it really wasn’t, but was just labelled that way. So, sizing on clothing labels is a tricky business for some women. I get it. 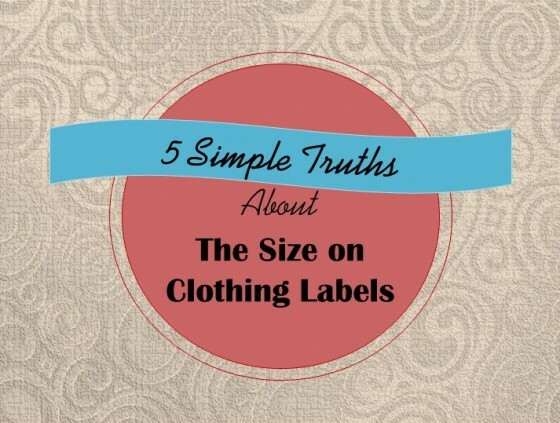 Here are 5 simple truths about the size on clothing labels. There is no consistency across labels in sizing. This is something many women have encountered when shopping, and when perusing the size in the labels of the clothing in their own closets. An item that is sized an “8″ in one label may be a “10″ or a “12″ in another. Sizing in women’s clothing is almost arbitrary and mostly meaningless. It is most certainly not deserving of all the attention, let alone angst, so many women assign to the size on the label of their clothes. We get to assign for ourselves what meaning, if any, we assign to the size/number on the label of our clothing. We can make the size or number in the label of our clothing mean “absolutely nothing” if we choose to. This is our choice! We can change the meaning we place on the size/number on the label of our clothing at any time – it is not cast in stone. If previously, or up until this very minute, you had assigned a lot of meaning to the number in your clothing labels, you can change that. Right now. If you choose to. Nobody else, and certainly no clothing manufacturer, has the power to make you feel bad about yourself without your consent because of a potentially random number on a teensy label on the inside of the clothing. That choice is yours.